PM elect Narendra Modi dreams of a Congress mukt (free) India. How does a 128 year old party die at the hand of one man? Ground zero is in Seemandhra (current Andhra Pradesh province - Telengana), a good place as any to observe why/how the GOP was crushed to zero. It was the cynical way that Congress went about the whole Andhra/Telengana division that doomed it at the voting box. It was instrumental in launching CBI cases against Jaganmohan Reddy son of the late and ex-Chief Minister (Congress). Just like with Lalu Yadav, Mulayam Yadav, and Mayawati, Congress uses the CBI stick to keep the B-team in line. The thinking was that Congress will swamp Telengana (orange) in collaboration with Telengana Rashtra Samity of TRS- the Telengana freedom party and form a post-poll pact with Jagan Reddy in Seemandhra (yellow) as well to defeat the main opponents Telegu Desam Party (TDP) and the BJP..
What happened instead is one for the pol science text-books. Congress vacillated till the last minute and made everyone (and his mother) angry. It should have launched a mass campaign in Seemandhra to explain that they would not lose out due to state division (primarily loss of Hyderabad). Indeed the best solution would have been to make Hyderabad an Union Territory and for the two states to share a capital (till an alternative was developed for Seemandhra). The wages of sin are now due and Congress is finished for ever in Seemandhra. It is already finished in large belts of North India (due to the first family managing to sabotage the rise of local leaders) and now it will only remain strong in Telengana and Kerala (with the Shudras of Karnataka are likely to move slowly but steadily into the BJP camp). The ruling Congress in Andhra Pradesh today suffered a major blow in the urban civic body polls in Seemandhra region, where opposition TDP put up a stellar performance, but stole the show in Telangana for whose statehood the party claims credit. Congress, which has ruled Andhra Pradesh for 41 of its 57 years of existence, faced a near wash-out in Seemandhra, which comprises the coastal Andhra and Rayalaseema regions, largely because it was seen as the villain of the piece for its role in the impending creation of Telangana, which will next month become a separate state. The former Chief Minister Chandrababu Naidu-led TDP has bagged over 60 municipalities out of more than 90 of them in the Seemandhra region. YSR Congress of YS Jaganmohan Reddy, who is staunchly opposed to the bifurcation of Andhra Pradesh, was placed second with 17 municipalities so far in its kitty. In Seemandhra, TDP bagged five corporations, including Vijayawada, while YSRCP clinched two among which was Kadapa, the native district of Jaganmohan. Congress, which was almost decimated in the coastal Andhra and Rayalaseema regions, has so far won more than 20 municipalities out of a total 53 in Telangana, which would come into being as a new state on June 2. Congress has pushed Telangana Rashtra Samiti of K Chandrasekhar Rao to the second position. 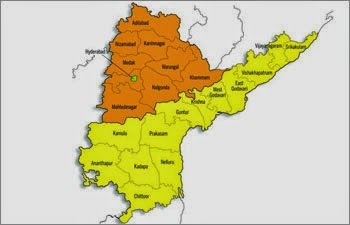 TRS, which was in the forefront of the agitation for a separate Telangana state, has so far bagged eight municipalities. TDP, which was once a major force in the Telangana region, has been relegated to the margins after winning just three municipalities so far. BJP bagged two municipalities. Several urban bodies in both the regions threw up hung verdicts. The polls to 145 nagar panchayats and municipalities and 10 corporations were conducted on March 30 against the backdrop of the passage of the contentious Telangana Bill in Parliament.